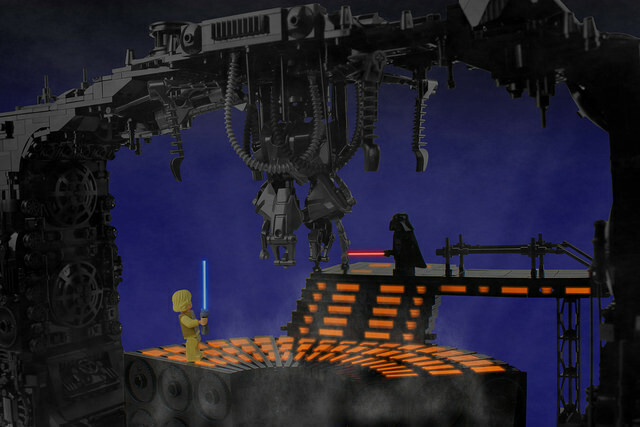 LEGO builder Andrew JN, whose excellent death of Obi-Wan Kenobi we featured a year ago, brings us this great rendition of one of the most tense scenes in all of Star Wars: the chilling first meeting of Luke Skywalker and Darth Vader in The Empire Strikes Back. Andrew says he worked hard to balance the lighting, so that the model captures the dark, foreboding aura of the scene, while still highlighting his fantastic work with the bricks. The great design of the carbon-freezing chamber is worth noting, built with unevenly stacked plates to form a semicircle.